C & B Therapy Spa, Portlaoise. 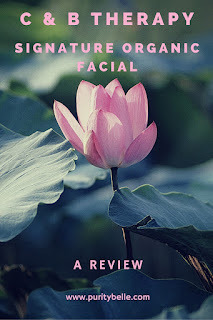 A Review of the C & B Organic Signature Facial. Updated info 30/12/15: Ciara and Beth made the decision to part ways at the end of 2015 and Beth is now continuing on as the owner of Wellspring Sanctuary. I wish both ladies every success for 2016! I was invited by the lovely Ciara and Beth of C&B Therapy to come and try their C & B Organic Signature Facial which uses the Éminence range of organic skincare products. Ciara and Beth are a very talented and experienced duo who have created a calm oasis in County Laois, focusing on beauty and well-being. Ciara trained at the Portlaoise College of Beauty and Complimentary Therapies and spent many years working at the Heritage Golf and Spa resort in Killenard, County Laois. She became a qualified reflexologist in 2007 and also obtained her diploma as a certified teacher in 2009. In 2011, she was named Best Beauty Therapist in Ireland by R.S.V.P magazine. Beth's specialty is massage and she attended the Swedish Institute in New York City in 1997 and went on to work in many high end New York hotels and gyms, including Trump International and the Waldorf Astoria. An interesting fact about Beth is that she has spent time volunteering for NYPD, the Port Authority and FEMA in Manhattan. Her journey took her to Dublin, where she spent some time working at the Merrion hotel and then on to the Heritage where a friendship and partnership was born. It's clear that these ladies are passionate about their work and their commitment to offering excellent service and I love the fact that they are friends as well as business partners because it gives a nice relaxed feel to the space. The salon is beautifully decorated in simple soft tones and is really soothing straight away - I felt at ease and calmed from the moment I walked in. They also have a gorgeous relaxation room where you can sit and have tea, and, like the rest of the space, it has a soft and soothing feel. My facial was absolutely amazing, I've been super stressed lately with lots going on and this was exactly what I needed, I really couldn't recommend it highly enough. 'Healthy skin is a reflection of what you feed your body, inside and out. That’s why we source premium ingredients from organic farms worldwide to ensure our products are USDA Certified Organic. The products smell so beautiful that it really adds to the experience, I think my favourite was the Citrus and Kale masque, it was so lemony! - Seven Herb Treatment - this contains Ground Ivy which strengths capillaries. - Citrus & Kale Potent C & E Masque - 47% reduction in free radical damage in just 3 hours, Calms skin, Brightens & lightens & reduces fine lines & wrinkles. The massage was fabulous too and I should mention too that my eyes had felt really red and puffy leaving my house in the morning but the combination of products and massage made them feel so much better. Here are some of the Éminence products, I'm definitely a fan after experiencing how gentle they are. Ciara and Beth have a great competition on their Facebook page - if you purchase a Christmas voucher you will be entered into a raffle and could win your own massage and facial! Don't forget to like the C & B Therapy Facebook Page and you can phone the salon on 0871206610 or contact Ciara and Beth at cbtherapy15@gmail.com. For full details on treatments, have a look at the Facebook page or contact Ciara and Beth directly at the Spa. I can definitely go for a massages, especially around the holiday times. Thanks, I will look into this more. Maybe plan a girls trip. I love me some facials which reminds me I need to purchase some more. I haven't had one in so long and that relaxation room sounds like a treat. Very cosy place. I've never been. Portlaoise is quite some distance away from Sligo. But this is certainly a great place for anyone who is into spa. I finally got my wife to treat herself to a facial while at Disney. I think I've created a monster now.